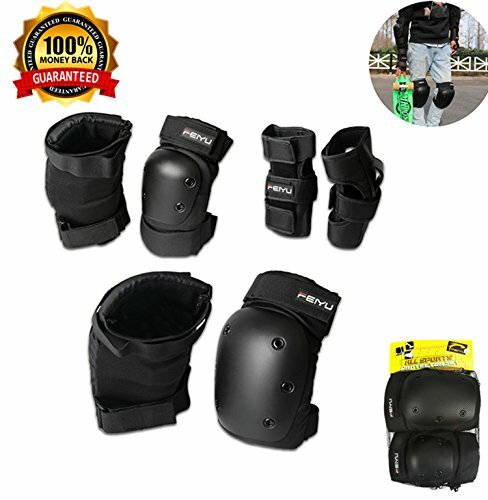 New Brand:YicCol Sports Protection Equipment Knee Pads Set. ☆ Soft Matrial,You feel comfortable. ☆ Durable and long life time. Soft and Conmfortable Material.If you are always on Your BMX or skateboard. and Have not a good Durable Gear to prevent from any serious injury Perfectly.So It is Suitable for you. Package Include: Knee Pad X 2, Elbow Pad X 2,Guards X 2, drawstring bag X 1. A drawstring bag is perfect for keeping this all together and transporting when out . Suitable Users:Adults,Men,Women,Children.Using for Skateboard Skateboarding,Roller Rollerblade,Bicycle Ride Bike Cycling,BMX bike,Inline Roller skate,Rollerskate,Free running,Parkour,X-Game,Electronic 2 wheel board,Ice-skating and Other extreme sports. The pads are made from a thick canvas material with velcro straps to secure in place that easily adjustable and manage to fit these on your wrist and elbows.The Pads Include Thick EVA Cushion,hard plastic shield and elastic Breathable Guard. High Quality Warranty and Full Payment Refund,Return Warranty if not satisfied. If you have any questions about this product by YiCol, contact us by completing and submitting the form below. If you are looking for a specif part number, please include it with your message.